Music takes an interesting, more dominant role in Final Fantasy X-2. With Yuna now somewhat famous after the events of Final Fantasy X, she seems to be a pop star figure in of sorts, especially if we're judging from the game's opening cutscene where she's singing and dancing to a pop song. Much like the different tones in their opening movies, Final Fantasy X's more sentimental feeling is replaced in X-2 with a mix of mostly fun upbeat funk, rock and pop pieces, but also a wider exploration of genres when needed for more humourous and dark scenes that are quite different to what was heard in X. The composer for X-2 isn't the same composer as Final Fantasy X and doesn't feature any compositions from Nobuo Uematsu, Final Fantasy's regular composer, which could have a lot to do with the different feeling of the music in X-2. While I'm a big fan of music from other Final Fantasy games and Uematsu's music, when X-2's is placed aside other Final Fantasy soundtracks (which I noticed during the recent Final Fantasy Record Keeper FFX-2 event), it's almost refreshing how different it is. Although it's not my favourite Final Fantasy soundtrack of all time, it's probably the most unique Final Fantasy soundtrack and it creates it's own sound while also balancing the Final Fantasy feeling from other soundtracks. Contrasting Final Fantasy X's emotional opening track To Zanarkand is X-2's Real Emotion, a pumping pop track full of all the catchy hooks you'd expect from a chart hit, a music video like feel and a dancing Yuna. Much like how To Zanarkand set the tone for the journey ahead in Final Fantasy X, Real Emotion does the same for X-2. 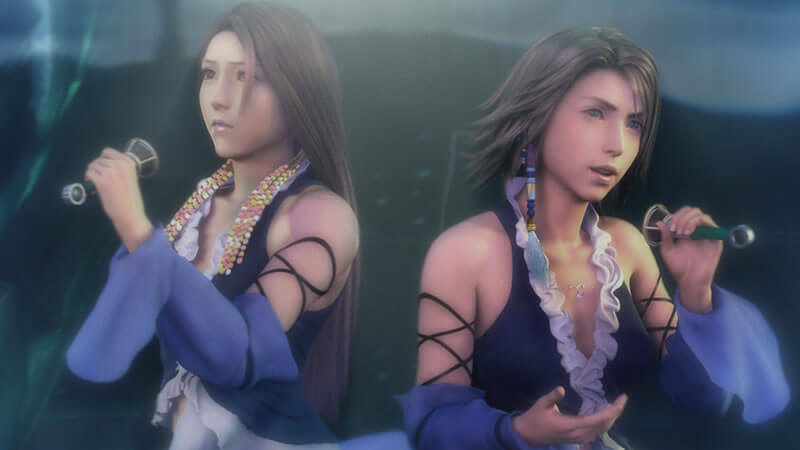 The music sets the lighter tone for the game, while the lyrics of the song are a good indication of how the current Yuna feels two years of from her last journey. This opening is rather strange for a Final Fantasy game, but it's fitting for the fun filled journey ahead and for fellow fans of pop music, I'm sure the pop number was a welcomed way to open the sequel. When playing Final Fantasy Record Keeper during the Final Fantasy X-2 event, I immediately noticed how different X-2's battle theme was from every other Final Fantasy battle theme. Instead of using a string section as the main instrument of the track, it's replaced by an electric guitar solo-ing like crazy. Another instrument that stands out in the track when compared to other Final Fantasy games before X is the use of an electric drum, which makes the track sound more modern rather than orchestral. The track still uses an orchestra, but mostly for support, but I'm glad it does as it's what makes the track maintain it's Final Fantasy feel. I was obsessed with Final Fantasy X-2's main ballad 1000 Words when I played the game for the first time and I still think it's a beautiful song. Because one of the game's themes is music and singing, it's no surprise this scene and song together create one of the most powerful moments in the game. Other than the stunning cutscene that plays along with the song, the song is truly made powerful by the lyrics and the amazing performances from Jade from Sweetbox for the English version and Koda Kumi for the Japanese version, with both woman belting out this track with the right amazing of emotion. If you pay attention to the lyrics of the song, it sums up the story of Final Fantasy X and X-2 really well, so when you finish the game and hear the orchestral version playing while the credits are rolling, it's a perfect way to end the series. While most of the main pieces in Final Fantasy X-2 are on the fun, rock-pop side, for moments like boss battles and enemy encounters, the music is chosen very well to fit the situation. If it's an encounter with a cheeky boss, an exotic Eastern style is used (such as Anything Goes For Leblanc!). If the crew are on their way down into a dungeon, a very dark orchestral piece is well (such as Bevelle's Secrets). If the story is exploring Yuna's softer side, a beautiful piano piece is used (like Yuna's Ballad, one of my personal favourite tracks from FFX-2). The best part is that the music is so appropriate for each situation, which is important since X-2's dialogue is fairly light-hearted most of the time. The music never fails at giving the right tone to show how the characters may really be feeling or at least how the player should feel. Which is your favourite track from Final Fantasy X-2? Which JRPG do you think has the most unique soundtrack?